It’s the most wonderful time of year. The time of year when fruit crisps, crumbles, cobblers, and pies are a plenty! Crisps and cobblers are a great way to enjoy seasonal fruit any time of year, but few things in life are better than a summer peach. and almonds, brown sugar, and butter make for a light, golden and perfectly sweet topping. 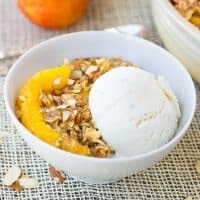 This topping over warm, spiced peaches and a scoop of creamy vanilla ice cream (coconut milk ice cream for me) is as good as summer dessert can get. Truth be told I can’t be trusted around fruit crisps. 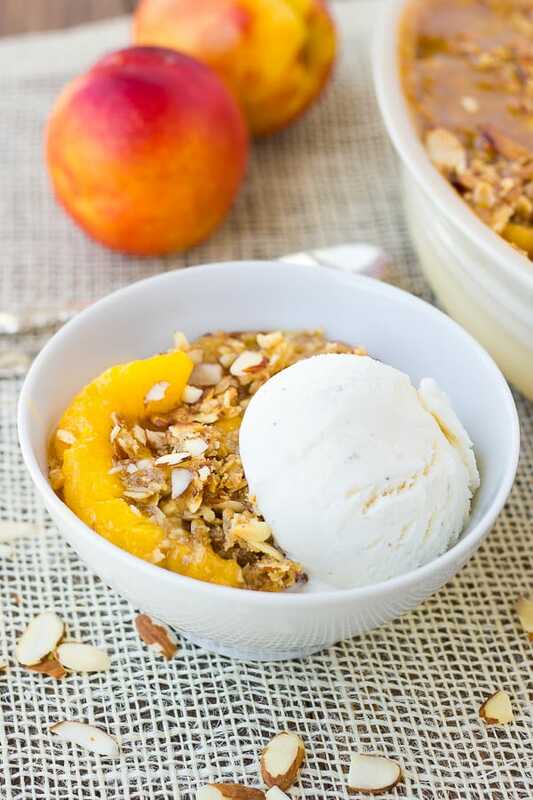 I made this peach crisp for a get-together with some friends this week and there was just a small corner left after everyone had some. Everyone loved it and the rest was eaten (by me), before the dishes were done. I’ve tried this both with a smaller deeper dish and a 9×13 pan. I prefer a 9×13 pan for this because the filling has a larger surface area to get nice and golden and crunchy. (The best part if you ask me!) It will work with a smaller dish too, but you may need to increase the baking time to 30 minutes. For the topping, Pulse 2/3 cup of the oats, flour, brown sugar, granulated sugar, vanilla, water, and salt in a food processor until combined, about 6-8 pulses. Sprinkle the butter and half of the almonds over top and process until the butter is the size of peas and the mixture is crumbly, about 5 pulses. Add the remaining almonds and 1/3 oats and combine with 2 quick pulses. For the filling, mix all the ingredients together. 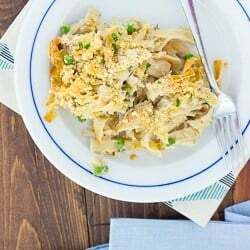 Pour into a 9×13 casserole dish or baking dish of choice. Sprinkle the topping evenly over the filling. Bake for 20-25 minutes until the top is golden and the filling is bubbly. Cool for at least 15 minutes before serving. Enjoy with ice cream, whipped, cream, or coconut milk whipped cream! I just made this recipe today and it is absolutely delicious! I used coconut sugar for all the white sugar so there was only 1/3 cup of sugar in the entire thing! Thank you for a great recipe! Great recipe – thank you for sharing! Made this for a crowd so I doubled the recipe and baked in three separate dishes. Didn’t have a food processor at the beach house where we’re staying so I used a blender to pulse the oats and a hand blender to incorporate the butter – turned out great and a big hit! Seriously??!!??!! Delicious! The bomb diddy! I made it for the 4th of July and I doubled the recipe to make a huge pan. It evaporated very quickly! 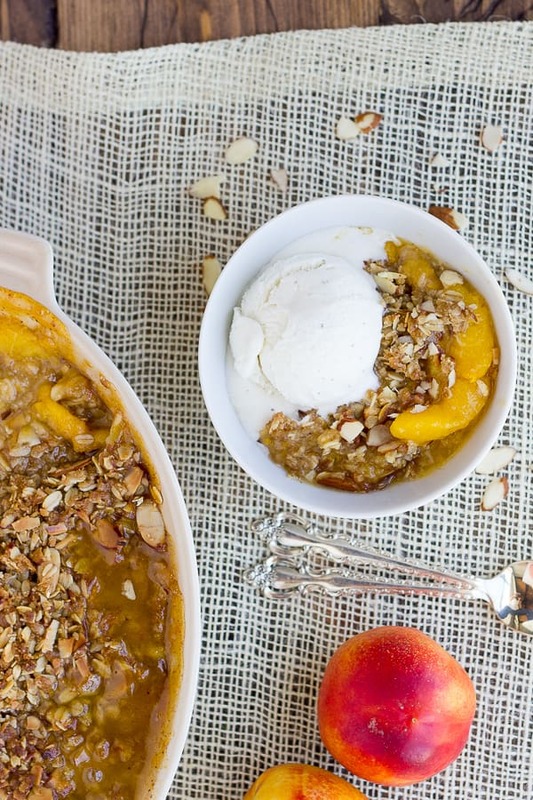 Just stumbled on this site looking for gluten free peach crisp. 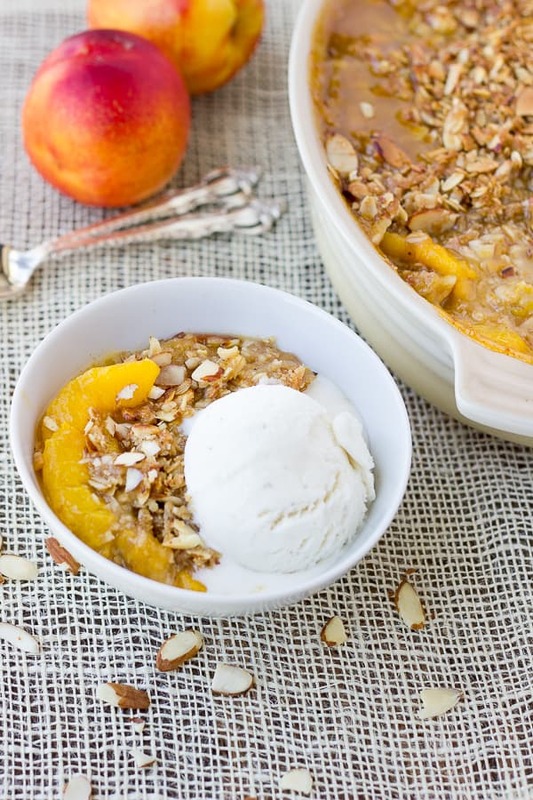 My husband adores peach crisp/cobblers but recently I was diagnosed with non-celiac gluten intolerance. This recipe will make both of us happy (will skip anything coconut though as my husband is allergic to it!). Thanks for sharing! I’m definitely giving it a try this week,peaches being on sale at the grocery store this week! Bonus!!! I hope you liked it! Good luck starting a gluten-free diet! Let me know if I can help with any questions! This is a delicious dessert, and quite simple to prepare. Thank you! !